Muscular dystrophy refers to a group of hereditary muscle diseases that weaken the muscles that move the human body. Muscular dystrophies are characterized by progressive skeletal muscle weakness, defects in muscle proteins, and the death of muscle cells and tissue. Nine diseases including Duchenne, Becker, limb girdle, congenital, facioscapulohumeral, myotonic, oculopharyngeal, distal, and Emery-Dreifuss are always classified as muscular dystrophy . Few or none of these symptoms may be present before diagnosis. Some types of muscular dystrophy can affect the heart, causing cardiomyopathy or arrhythmias. The diagnosis of muscular dystrophy is based on the results of a muscle biopsy and increased creatine phosphokinase (CpK3). In some cases, a DNA blood test may be all that is needed. A physical examination and the patient's medical history will help the doctor determine the type of muscular dystrophy. 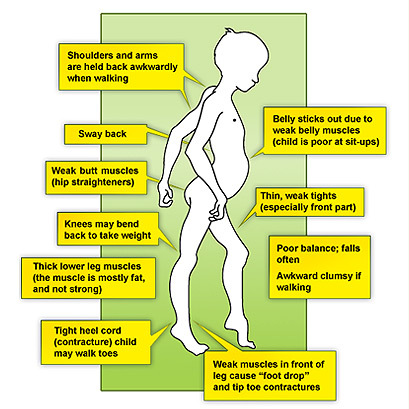 Specific muscle groups are affected by different types of muscular dystrophy.